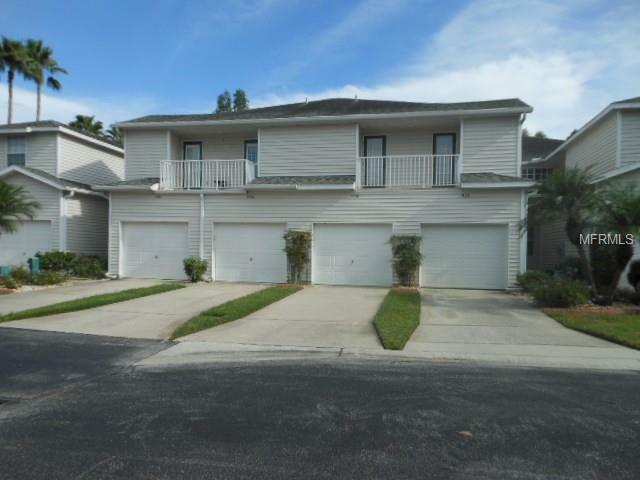 Short Sale, Bank Approved List Price that includes 3% towards Buyers Closing Costs. Back on the market, Buyers financing was just denied, but their home inspection went well. This 3 bedroom, 2 bath, 1 car garage two story, has entryway through either your own attached garage or a lovely sidewalk leading to your front entrance. Enter to an elegant staircase leading to all Living areas situated on 2nd floor. Front and Back Patios, where each bedroom has its own patio door. Rear screened balcony is private and overlooks the peaceful canopy of tree lined conservation with wildlife. The spacious interior has 1862 sq. ft. of heated living space with a formal Dining area and a central kitchen that also has a breakfast bar overlooking the Living room. Cathedral ceilings throughout and an indoor Utility room off of kitchen, so can be used for extra pantry items. The Master Bedroom boasts his and her walk in closets and a Master Bath with dual sinks, large corner Garden tub and separate shower stall. Heron Cove's maintenance free condo fees are only $270/month and covers gated entrance, fall Exterior Building Maintenance, Landscaping, Roof, Common Area Maintenance, pool and lake access and more. Heron Cove is a private Community featuring a nature trail, Community Pool, Spa and Clubhouse. Community maintained Dock for Fishing and a Boat ramp for Canoe/Kayak access to enjoy peaceful Lake Bird. Roof just replaced and A/C was replaced in March 2015. Additional Water Information Community Boat Ramp For Easy Access To Kayaking/Canoeing Or Just Fishing Off Of The Dock.